MirrorSync 4 Released and DevCon Discount Extended! 360Works MirrorSync 4 Released and DevCon Discount Extended! 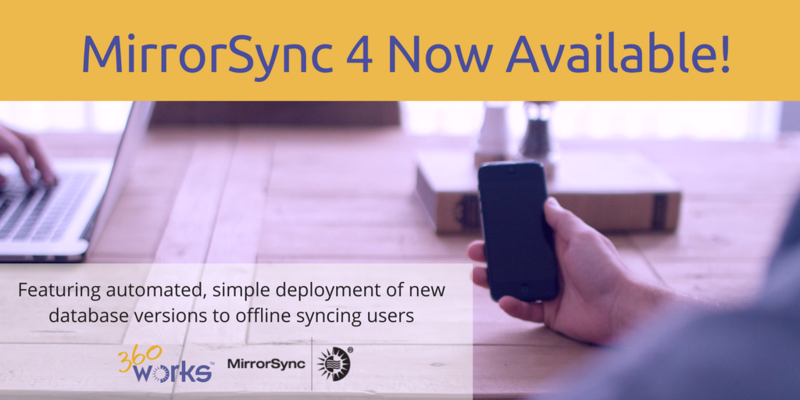 We are proud to announce the release of MirrorSync 4, which introduces automatic downloads! You can now rollout updated versions of your database, then have your users painlessly download the latest version after completing a sync. Because MirrorSync 4 was not available to download last week, we are giving you an additional week of our DevCon discount! Use code DEVCON2017 at checkout to receive 15% off of all online orders for 360Works plugins and add-ons until Wednesday, August 9, 2017. This discount applies to renewals and upgrades as well; you won?t want to miss out on this opportunity to upgrade to MirrorSync 4 and our newly upgraded plugin lineup! 360Works MirrorSync is the fastest and easiest synchronization tool for FileMaker. It allows everyday FileMaker users the power to synchronize their FileMaker Server files with FileMaker Pro, FileMaker Go, other FileMaker Servers, and SQL databases including MySQL, Wordpress, Salesforce and Amazon Redshift. MirrorSync continues to be known for its scalability, reliability, speed, and simple setup. Programming changes to hosted databases will now be automatically downloaded for offline clients after a successful sync. No separate database needs to be installed for this to work. The process for this is explained in the configuration screens. * Rebuilding the sync data gives an option to specify a cutoff date for when the databases were known to be in sync, making the rebuilding process much faster. A maintenance subscription was added with MirrorSync 3, and we will continue this licensing model with MirrorSync 4. Enjoy one full year of free major and minor upgrades with your purchase of MirrorSync. After your one year is up, you can optionally pay a maintenance fee of 25% to continue receiving all major and minor upgrades for another year. Selecting auto-renew at checkout will save you time and money, as you receive an additional discount of 10% off of the maintenance fee and your MirrorSync maintenance will automatically renew without you having to remember to come back and re-enter your information all over again.